Perfect for the Holiday Seasons throughout the Year!!! Each Candle Available for Purchase on the Gift Page of our Catalog Page. Available in two colors: Aged Ivory and Marble Gray. During the Medieval Ages ivory carving reached its zenith. Ivory tusks were masterfully carved into panels of art. Some depicted the triumphs of emperors and kings, but most where religious in nature – bringing Biblical scenes and the Christ story into vivid relief. The carved panels where then used as the centerpieces of elaborate book covers – fashioned from gold and silver and encrusted with rare jewels. These covers were the treasure bindings of the age’s most precious illuminated manuscripts. The artisans of Illuminated Art have painstakingly re-carved and re-mastered each of these centuries worn panels – breathing in a depth of detail and life into each piece that very few surviving originals can hope to match. 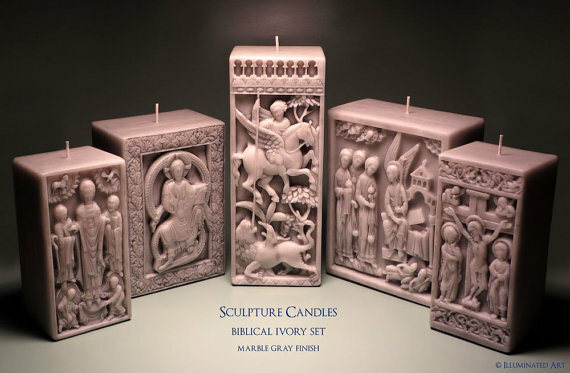 Each hand poured and handfinished Biblical Ivory sculpture candle is made from a premium beeswax blend. 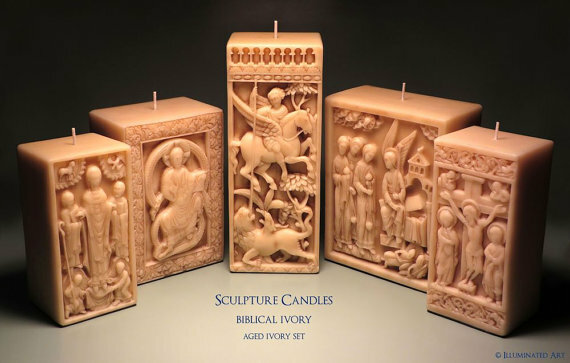 They are eye-catching decorative centerpieces, however if chosen to be lit they have been specially designed so that as the wick burns down the flame illuminates the carved relief with a subtle heavenly glow.